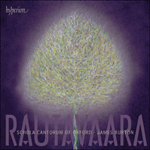 In the early 1990s the Tokyo Philharmonic Chorus commissioned Rautavaara to write an extensive choral work, specifying that the text and music were to ‘have a relationship to the world of today’. The result was the Canción de nuestro tiempo (1993), for which Rautavaara chose poems by Federico García Lorca which, though written in the 1920s and 1930s, he felt were still very relevant. The first of the work’s three movements, Fragmentos de agonía (‘Fragments of agony’), shows the harsh, inhuman world of industrial society and war through surrealist poetic images. The mechanical ostinato progresses inexorably; the parallel with the opening of the Suite de Lorca, written two decades earlier to a text by the same poet, is clear. Finally, the moon rises (echoing another passage in the Suite de Lorca). The musical material here is derived from the same twelve-tone row as Rautavaara’s Seventh Symphony and Die erste Elegie. Meditación primera y última (‘First and last meditation’) is built on a recurring Rautavaara device: a mid-range sound field with superimposed melodies. The material here is adapted from a scene in the opera Thomas, and Rautavaara later orchestrated it for his Eighth Symphony. The sound-field device appears in more organized form in Canticum Mariae virginis, and also in the more extensive Katedralen. In Ciudad sin sueño (‘Sleepless city’), Rautavaara so strongly identified the powerful imagery of the poem with the then current situation in world politics that he subtitled the movement Nocturno del Sarajevo. The opening of the movement, with piercing cries over a steady pulsation, is very similar to that of Die erste Elegie. The melodic material in the soprano part progresses largely in parallel fourths and is flavoured with small glissandos. Despite the ‘nocturno’ character, there are passionate outbursts and powerful emotions in the music. Au début des années 1990, le Tokyo Philharmonic Chorus commanda à Rautavaara une vaste œuvre chorale en précisant que le texte et la musique devaient «être en relation avec le monde d’aujourd’hui». Ainsi naquit la Canción de nuestro tiempo (1993) sur des poèmes de Federico García Lorca datant des années 1920 et 1930 mais que le compositeur jugea encore fort pertinents. Le premier des trois mouvements, Fragmentos de agonía («Fragments d’agonie»), montre, à travers des images poétiques surréalistes, le dur monde inhumain de la société industrielle et de la guerre. L’ostinato mécanique progresse inexorablement; le parallèle avec l’ouverture de la Suite de Lorca, écrite vingt ans plus tôt sur un texte du même poète, est évident. Pour terminer, la lune se lève (écho à un autre passage de la Suite de Lorca). Le matériau musical dérive ici de la même série dodécaphonique que la Symphonie no 7 et Die erste Elegie de Rautavaara. Meditación primera y última («Première et dernière méditation») repose sur un champ sonore d’étendue moyenne avec des mélodies surimposées, un procédé récurrent chez Rautavaara. Ici, le matériau est adapté d’une scène de l’opéra Thomas—plus tard, compositeur l’orchestrera pour sa Symphonie no 8. Ce même procédé du champ sonore se retrouve, sous une forme davantage organisée, dans Canticum Mariae virginis et dans une pièce plus vaste, Katedralen. Dans Ciudad sin sueño («Ville sans rêve»), Rautavaara identifia tant la puissante imagerie du poème à la situation politique mondiale de l’époque qu’il sous-titra son mouvement Nocturno del Sarajevo. L’ouverture, avec ses cris perçants par-dessus une pulsation régulière, est très similaire à celle de Die erste Elegie. Le matériau mélodique, au soprano, progresse surtout en quartes parallèles et est pimenté de petits glissandos. Nonobstant son caractère de «nocturno», la musique recèle des déchaînements fervents et de puissantes émotions. Zu Beginn der 90er Jahre beauftragte der Philharmonische Chor Tokio Rautavaara mit einer großen Chorkomposition, bei der der Text und die Musik „eine Beziehung zu der heutigen Welt“ haben sollten. Das Ergebnis war die Canción de nuestro tiempo (1993), für die Rautavaara Gedichte von Federico García Lorca auswählte, die er immer noch, obwohl sie in den 1920er und 30er Jahren entstanden waren, für relevant hielt. Der erste der drei Sätze des Werks, Fragmentos de agonía („Fragmente des Leidens“), zeigt die harte, inhumane Welt der industriellen Gesellschaft in surrealen poetischen Bildern. Das mechanische Ostinato drängt unaufhaltsam voran; die Parallele zu dem Beginn der Suite de Lorca, die zwanzig Jahre früher zu einem Text desselben Dichters entstand, ist deutlich. Schließlich geht der Mond auf (was an eine andere Passage aus der Suite de Lorca erinnert). Das musikalische Material bezieht sich in diesem Falle auf dieselbe Zwölftonreihe wie Rautavaaras Siebte Symphonie und Die erste Elegie. Meditación primera y última („Erste und letzte Meditation“) basiert auf einem wiederkehrenden Rautavaara-Stilmittel: ein Klangfeld im mittleren Register mit darüber gelagerten Melodien. Das Material stammt dabei aus einer Szene der Oper Thomas; später orchestrierte Rautavaara es in seiner Achten Symphonie. In organisierterer Form erscheint das Klangfeld in dem Canticum Mariae virginis und ebenso in dem größer angelegten Katedralen. In Ciudad sin sueño („Stadt ohne Träume“) identifizierte Rautavaara die ausdrucksvolle Metaphorik des Gedichts so sehr mit der damaligen weltpolitischen Lage, dass er dem Satz den Untertitel Nocturno del Sarajevo gab. Zu Beginn des Satzes erklingen schrille Schreie über einem kontinuierlichen Pulsieren, was sehr an Die erste Elegie erinnert. Das melodische Material der Sopranstimme schreitet hauptsächlich in Quartparallelen voran und ist mit kleinen Glissandi angereichert. Trotz des „Nocturno“-Charakters finden in der Musik mehrere leidenschaftliche Ausbrüche statt und es kommen starke Emotionen zum Ausdruck. pero ninguno la lengua azul de la playa. or the shoreline’s blue tongue. or the yellow wheel of the tambourine. Agony, agony, dream, ferment and dream. y el que teme la muerte la llevará sobre los hombros. atacarán los cielos que se refugian en los ojos de las vacas. Out in the sky, no one sleeps. No one, no one. Lunar creatures sniff and circle the dwellings. an incredible crocodile resting beneath the tender protest of the stars. they had to call the dogs to quiet him. Life is no dream. Watch out! Watch out! Watch out! or we climb to the snow’s edge with the choir of dead dahlias. and those who are frightened by death will carry it on their shoulders. will attack the skies that take refuge in the eyes of cattle. and the camel’s fur bristles with a violent blue chill. whip him, my children, whip him! Out in the world, no one sleeps. No one. No one.